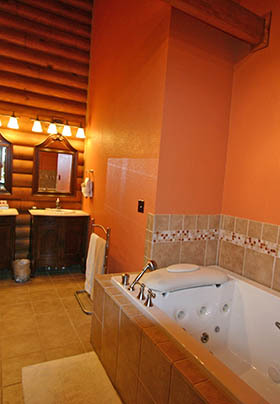 Located on the upper floor of our vacation rental “The Cabin at Wildberry”, your Honeymoon Cabin Suite is true luxury. 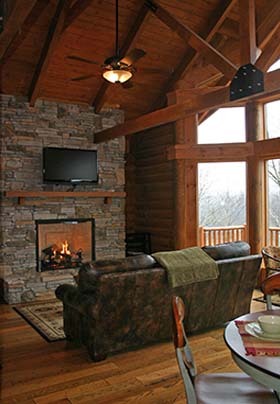 This is the largest most luxurious suite on the property and is a perfect way to indulge during your getaway near Asheville NC, whether it is your honeymoon or not! This unique mountain accommodation gives you the fabulous Smoky Mountain and sunset views through the 20-foot wide bay of glass. It features a king-size four-poster bed, living room area, full kitchen, large deck, gas grill and large spa bathroom. Step out the door and step onto our 2+ miles of onsite trails. Watch the sunset then relax on the deck or in front of the large gas fireplace. Breakfast is not included in the cabin suites. As an optional extra, seating capacity permitting, our Cabin guests are welcome to join our bed and breakfasts guests at the Wildberry Lodge for a three-course gourmet breakfast. The charge for breakfast in the Inn is $18.00 per person per day.